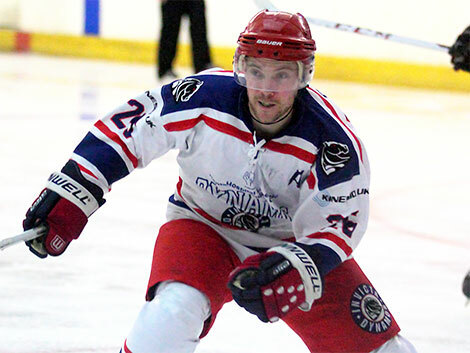 The Invicta Dynamos began 2014/15 with a win as Andy Smith’s four goals, alongside efforts from Danny Terry, Adam McNicoll, Steve Osman, Juraj Huska and Callum Fowler, helped the Mos down the newly promoted Oxford City Stars 9-7 at the Silver Blades. After a summer of change it was a familiar face that got the Dynamos going as early as the third minute on Saturday night – Darren Elliott’s suicidal pass from his own zone allowing Callum Fowler and Andy Smith the 2-on-1 with Smith dispatching home from close left shorthanded at 02.26. Penalty trouble then saw their attacking exploits halted as Callum Fowler and Elliott Dewey each took minors gifting the visitors a two man edge – an advantage they used to good effect. At 09.12 Jamie Newton escaped Adam McNicoll’s valiant attempts to hold him up in the corner before a quick pass to the slot was thundered over the line by an atoning Darren Elliot right in front. At 12.54 the Stars then took a surprise lead – Elliott winning a faceoff in the right circle and James Pentecost doing the rest with quick hands on the edge of a crease before a neat backhand finish. Their time in front would last only until 17.44 though – Joe Oliver watching from the box as Arran Strawson’s shot from the right rebounded to Callum Fowler between the circles for the powerplay leveller. In the second period the Dynamos once again wasted little time in getting going as debutant Steve Osman marked his first appearance with a strike that made it 3-2. Arran Strawson’s breakout pass sent Callum Fowler down the left and his play to the back stick was coolly turned in by the former Wightlink man to put the Mos ahead at 22.06. 31 seconds later it was then 4-2 – Nicky Lewis sitting a minor as the Stars shot themselves in the foot again – Joe Oliver surrendering possession to Andy Smith between the circles and the forward driving in high off of the crossbar for the two goal edge. To their credit Oxford rallied quickly and answered at 23.14 – Michael Whillock finishing low from point blank range after a quick trio of shots for 4-3 – but the Mos finished the frame the stronger and were good value for their eventual 5-3 lead. Steve Osman almost had a second but his backhand from the left that caught the bar was judged to have bounced the wrong side of the goal line before Adam McNicoll registered a shot that would count at 37.16. Callum Fowler did much of the work by leading Josh Florey on a merry dance before a centering pass allowed teammate McNicoll to poke in from the edge of the netminder’s crease with time running out. In the final period the Dynamos continued their trend of starting quickly and had added two more to their tally within just 70 seconds of the restart. Juraj Huska claimed the first with a low slapshot from the left boards that thundered through the five-hole of an unsighted Ryan Bainborough at 40.09 before Andy Smith completed his hat-trick at 41.10 with a one time finish at the far post following fine hold up play from his Slovak teammate the other side of the net. Oxford then stemmed the tide at 45.49 with a fortuitous fourth to cut the deficit to 7-4, as Darren Elliott’s wayward effort from the left boards clipped the skate of Greg Chambers in front to direct the puck beyond Chris Douglas, only for the Mos to cancel out their response as soon as 46.16. Andy Smith was once again the scorer as his perfectly placed slapshot from the left circle flew beyond Bainborough and into the top far corner for a considerable 8-4 edge. With time winding down on a seemingly comfortable win the Mos then took the opportunity to switch netminders at 55.08 but replacement shot stopper Steve Nightingale’s first duty was to remove the puck from his goal as the Stars found a second wind. At 55.44 a perfect cross ice pass from James Pentecost left Jamie Newton a far post finish but the Mos answered swiftly at 57.37 when Danny Terry claimed his first senior strike with a low pinpoint shot from the blue line. Nevertheless the Stars finished stronger and added two more late consolations to make the score a more respectable 9-7. The first of these came at 58.31 courtesy of a high near post finish from Jacob Smith close right whilst the second followed at 59.40 as the puck bobbled home off of the stick of Nick Oliver in the slot following a pass from Josh Oliver. So it was a win for the Dynamos in their opening fixture but one that looked as much like the early season encounter that it was with the team’s best only really being exhibited in glimpses. Nevertheless Head Coach Kevin Parrish will be pleased to have put two points on the board with an eye on what needs to improve over the coming weeks. Man of the match awards went to Darren Elliott of Oxford whilst four goal hero Andy Smith took the accolade for the Mos. Welcome to the all new invictadynamos.co.uk!